Device WebAPI Plug-in by GClue, Inc. — virtual server with a web API for operating the device. Mesh Plug-in by Sony Corporation — IoT block kit supporting various sensors and a remote button (without a smartphone). Evryplace Sync by Fream — seamless image uploads and syncing via mobile. HoloBuilder 360 SiteStream by HoloBuilder Inc — for livestreaming construction sites in 360 degrees, 24/7, with remote zoom. Fita by Everywoah — connects Theta V to Google Cloud Storage. There are already some compelling options for expanding the usability of your Theta V camera, but Ricoh also promises that more are on the way, both from the company itself and other third-parties. 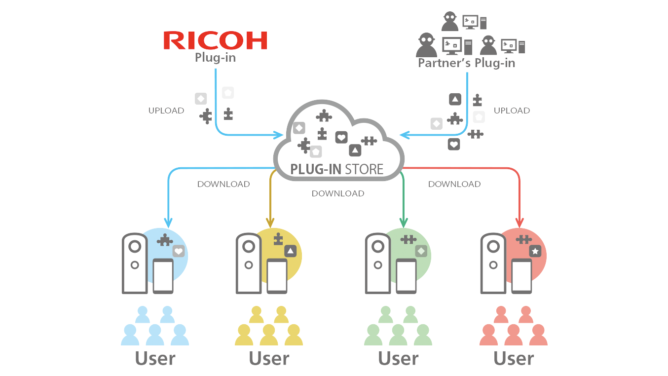 If you want to see what else is coming up, check out the roadmap for future plug-ins that Ricoh has shared, including time-lapse shooting. In the meantime, if you have a Theta V, check out what's already available in the Plug-in Store. TOKYO, July 23, 2018 – Ricoh today announced the RICOH THETA Plug-in Store has gone live. The new, online marketplace makes available downloadable software plug-ins that provide new functionality for the RICOH THETA V fully spherical camera, such as wireless live streaming, remote camera control, automatic image uploads and much more. Starting today, plug-ins created by Ricoh and such organizations as Sony, NTT DOCOMO and HoloBuilder can be downloaded from the site. The plug-ins are being created by members of the RICOH THETA Plug-in Partner Program, which allows third-party developers to create their own Android™-based software plug-ins for the RICOH THETA V, a camera capable of capturing fully-spherical 4K-equivalent video and high-resolution still images. Based on the open-architecture Android operating system, the RICOH THETA V is unique among 360-degree imaging cameras in that its functionality can be further expanded by installing plug-ins. Ricoh kicked-off the RICOH THETA Plug-in Partner Program last month, with a website that provides easy access to tools and online support. Since then, many developers have joined the program, and five third-party plug-ins are currently available from the store. Three new plug-ins developed by Ricoh are also available. Ricoh intends to continue to add capabilities to the development environment to meet the needs of consumers and businesses. NTT DOCOMO has created new functionality for the existing WebAPI plug-in (developed by GGlue) that enables it to collect information from and control the function of the RICOH THETA V’s built-in sensor. The Device WebAPI Plug-in conforms to OMA GotAPI specifications, which builds a WebAPI on the RICOH THETA V device, and enables function access via a common WebAPI on other devices such as smartphones. MESH is a platform of app-enabled smart triggers that can transform everyday objects into smart devices that can be controlled from a phone or tablet. The new MESH plugin for RICOH THETA enables direct control of the RICOH THETA V via a MESH block. EVRYPLACE Sync allows for seamless uploads of images created using RICOH THETA V camera and the EVRYPLACE app. Using the plugin, individuals using the EVRYPLACE editor can get instant updates on their projects. They can choose 360 images on RICOH THETA V, open the EVRYPLACE app, and then upload these directly from the camera to their project. EVRYPLACE is ideal for real estate sales, delivery documentation, insurance documentation, training material updates and more. HoloBuilder's 360 SiteStream plug-in gives construction companies 24/7 access to view construction sites in 360° through livestreaming (Livestreaming duration depends on usage environment). Users can set up a RICOH THETA V in mission-critical locations on a construction site and then remotely zoom into the project from anywhere to see what is going on in real time. The plug-in allows adding an infinite number of 360-degree livestreams. The plug-in is part of HoloBuilder’s reality-capturing solution, which enables integration of livestreams into existing HoloBuilder projects to combine all visual site documentation. Fita is a plug-in suite that enables RICOH THETA V owners to connect to Google Cloud Storage. As an onboard RICOH THETA V camera plug-in and a companion Android or iOS app for your device, Fita allows the RICOH THETA V to upload media to a connected Google Cloud StorageTM account for optimal workflow and team collaboration for 360-degree photo and video workflow over Wireless LAN. Android, YouTube, Google Cloud Storage, and Google Photos are registered trademark of Google Inc.